Librarians and educators are constantly seeking books about seasons and revisit perennial favorites for storytimes and classroom use year after year. Full of Fall has quickly become one of those favorites. Utilizing short rhyming text with breathtaking photos of fall foliage, animals and scenes, April Pulley Sayre gives readers a lush reminder of why fall is so lovely. Combined with a hearty amount of backmatter including information regarding why leaves change color, how animals prepare for winter and which trees are marcescent, this title is perfect for older readers looking to glean more information about seasonal change as well. A photo illustrated book has never won the Caldecott, Full of Fall would be a perfect first. On a personal note, as a fellow Hoosier, from the northwest part of the state, I loved seeing some of my childhood stomping grounds represented here. In particular Sayre has used fantastic scenes from Potato Creek State Park and Warren Dunes . 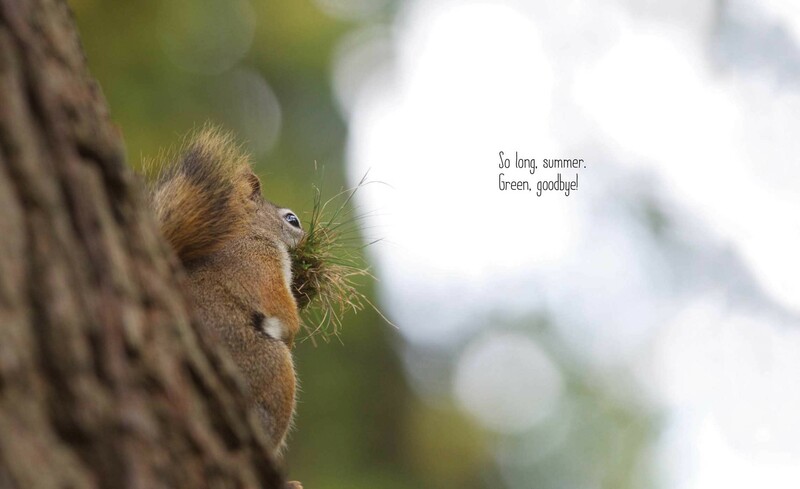 Also, sometimes I really miss seeing the red pine squirrels featured in this title–they’re just so cute! It may not feel like it but yesterday was the first day of autumn. To welcome fall (and some hopefully cooler weather) we read a poem and a story about how summer changes into fall and danced like falling leaves. We followed a bear on a hike over a mountain and marched along. Then we read and sang about my favorite part of fall, apples! We learned how an apple tree grows apples throughout the year and then pretended to be apple trees. Finally we watched a movie based on the book by Peter Brown which follows a bear explaining why Children Make Terrible Pets. Check out the list below of books, songs and rhymes. School is in session, the nights are cooling off, and it is hard to make it through a day without se eing something that is pumpkin-spiced flavored – Fall is here. The Library is welcoming the change in seasons with a new Bookmobile Schedule. The Fall Bookmobile schedule runs from August 28 – December 21 and features multiple new Bookmobile stops, including Waterfront Hy-Vee, Emerson Point, Iowa City Walmart, and Mark Twain Elementary. With nearly two full weeks of service under our belts already we are already making connections at our new and continued stops. Our first visit to Emerson Point felt like a party, with the Bookmobile consistently filled with excited, new visitors, several of whom made use of our accessibility lift. Last week on Talk of Iowa’s Horticulture Day, Charity Nebbe interviewed Ryan Adams, turf grass specialist, on the best time to reseed a lawn. Lawn and garden care is something I need to learn a lot about, being a newbie homeowner. Our garden spaces are in much need of attention and care as well, but where to start? Lucky for me, I have been immersed in our nonfiction catalog and have been getting to know where to find the books that will help me make my lawn and garden beautiful again. To inform my lawn and garden needs this fall and next spring, I will be using a “Plant by Number” system, inspired by the numbers in ICPL’s nonfiction collection. The Dewey Decimal numbers will guide me to the best information in the library’s collection for each part of my lawn and garden planning. Keep reading for the best numbers for perennials, trees, and specialty gardening topics. Photo by Bobby Jett. Gardening by Beth Beasley, Maeve Clark, and friends. Photoshopping of the identification signs by Melody.